At Perfect Smile Dental we are committed to provide you the highest quality available at the best cost possible. That is why we will match any local competitor's price, if the total cost of identical dental procedures and services offered is lower than our advertised or quoted grand total price. We will not be undersold by dental clinics who advertise lower prices and make up for it on hidden and other charges. Remember, you also get what you pay for. Cheaper prices do not always translate to quality products. If you find a better price online or quoted to you, just email us the website, the dental procedures (s) in question, quantity, we will investigate immediately and respond with our match. 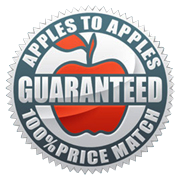 Our Price Match Guarantee only applies when approved in writing by Perfect Smile Dental and prior to your first appointment.